This article details the compilation and write of a "blink" program to a pic18f4550 microcontroller. 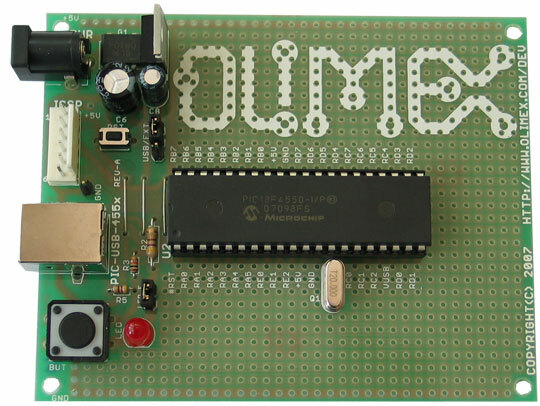 A "blink" program is the "hello, world" of microcontrollers. Its purpose is to familiarise the user with the hardware and toolchain. After this, you should have the ability to do something useful. The challenge here will be attempt to do this using solely open source tools in GNU/Linux. As it turned out, this wasn't entirely possible with the hardware I had. Choosing a programmer with ICSP header, allows a chip to be programmed without moving it from the development board. You do, however, need a development board with an ICSP header. Also make sure that there is software support for your particular chip/programmer combination. Compile it as a module, then load. Check that it's loaded using lsmod. Include in the /etc/conf.d/modules config file to load it during boot. It is always better to use a package manager than installing from source, if you have the option. The last three programs are part of the gputils package (see also pdf). These tools will be used first from the command line, then later using a Makefile. The #pragma config refers to the configuration bits of the chip, not all of them are explicitly set here (see pdf). It might be neater to store these in a separate header file (e.g. config.h) such that they can be included in multiple programs. Check the header file or the documentation to find out exactly what they refer to. Install your chip in the programmer and plug it in. If everything goes well you should get no output. Else, if you didn't erase your chip you may get whatever was leftover from a previous write. To run the program, unplug the ICSP cable and plug in an external power source. If it works, congratulations! Else you've probably made a mistake somewhere, time to debug. Personally I had a lot of trouble with this hardware. After trying picp, picprog and piklab, I found out that the combination of chip and programmer that I had chosen didn't work with any linux programmer software. Mental note to always check if there was a linux support for hardware before you buy it. One way to debug is to measure the voltage at the pins with a DMM. I've also written code that flashes the LED after each line and counted the flashes until the program breaks. With more complicated programs, you can use a button to step through lines of your code and measure the pins with a DMM after each line. You will find all the information you ever wanted (and didn't want) to know from the Microchip data sheet on your paticular chip. Read the device overview and I/O summary. If you manage to get the blink program working, congratulations! 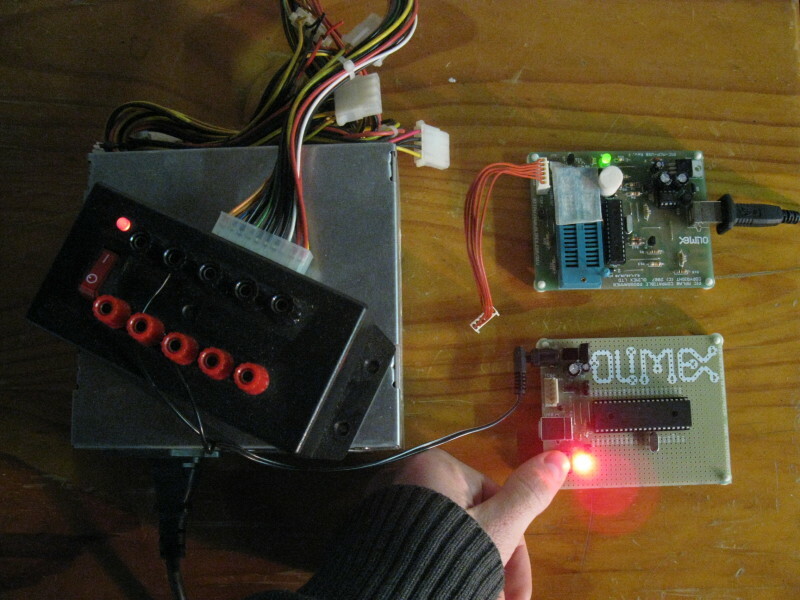 Try modifying the code so that the button turns the LED on or off (see Figure 1). Or, if you can do that, randomize the blink delay each time the button is pressed. The possibilities are many. Happy programming. Note: if you copy and paste this Makefile, ensure that the whitespaces are tabs NOT spaces or Make will complain.